Set in the scenery of a treasure-packed cave, Crystal Rift is an easy-going video slot machine produced by Microgaming built on the provider’s familiar layout with 5 reels, 3 rows, and 25 fixed paylines. Featuring a set of innovative options including Bonus Falls and Wild Grid, the game comes with a maximum winning potential of 2.000 coins. 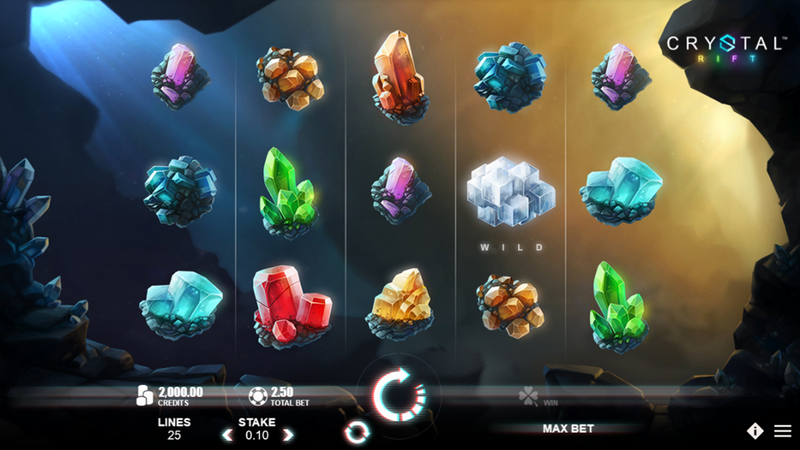 Apart from these interesting options, the game should captivate players with its simplistic yet stunning visual appearance, so find out the details in the Crystal Rift slot review. Unfortunatly, we have no free play mode for Crystal Rift available. Check out the screenshots below and hop right into action with one of the recommended casino sites! Basically, this is one of those games you can play for fun or for real money. In reality, the book of rules won’t change a single letter, but the difference is the Crystal Rift Free Play mode awards demo credits instead of real money. As the name suggests, crystals of all shapes, colors, and valuations dominate the paytable, each with a different payout rating. Amber pays the most and you have to collect 3, 4 or 5 to receive 100, 500 or 2.000 coins. Green, Yellow and Red crystals are the second-best choice granting 20 to 500 coins. In all other cases, you should act happy when receiving 4 to 100 coins for combinations of 3 to 5 matching items. A massive translucent cube works as the Wild and substitutes all paying symbols. Also, its dual nature made it a highest-paying icon able to bring you a big win of 2.000 coins should 5 of a kind appear on an active payline. Players of all experience levels get to enjoy a wide variety of betting combinations thanks to the coin values ranging from €0.01 to €2. According to your specific strategy, it is possible to wager between €0.25 and €50 per round. Any winning combination during the base game will trigger the Crystal Rift Bonus feature. All symbols used in the combo disappear, while the remaining fields are filled with icons falling from above. The Bonus Fall round starts and will be repeated for as long as you keep winning. At the beginning of each Bonus Fall round, a Wild Grid will be randomly chosen and you’ll see an indicator pointing its positions. When 3 Bonus Falls are completed, the Wild Grid feature starts and lucky winners will score Basic, Super, Mega or Insane Win – named after a corresponding grid. We hope this rewarding feature will be enough to compensate for the absence of standard Crystal Rift Free Spins. 3. What is the RTP factor of Crystal Rift? The official RTP info is still to be disclosed by Microgaming. Soon after, we will update the Crystal Rift tutorial. Following a bit unusual setting applied to the bonus game, this is a title we recommend to the widest audience ready and willing to experience something new. The Crystal Rift recension compiled some proven tips that should help you score the big win, so try them on whenever you’re ready.